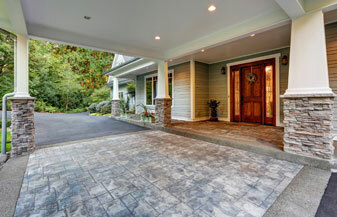 The driveway is one of the most overlooked areas of the home in terms of maintenance, but there’s no doubt that an uneven, cracked, or sunken driveway can be an eyesore. If your concrete or paver driveway has seen better days, we can help with cost-effective repairs that don’t just restore the function and appearance to your driveway but also boost your home’s curb appeal. We also install beautiful concrete paver, concrete, and stamped concrete driveways if your driveway has reached the end of its lifespan. 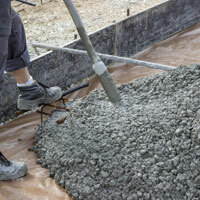 We perform all types of concrete driveway repairs and installation. 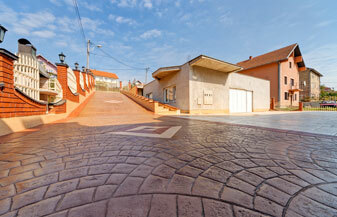 Pavers can be used to create an eye-catching and very durable driveway. We install and repair paver driveways in popular patterns like herringbone, basket weave, and ashlar. For a cohesive look, pavers can also be used for a coordinating walkway or patio. Concrete driveways require less maintenance than asphalt and tend to last longer. If your current driveway has reached the end of its life or you are installing a brand-new driveway, contact us to learn more about new concrete driveway installation and design options. Stamped or textured concrete is concrete that is patterned to mimic the appearance and feel of brick, tile, slate, or wood. A stamped concrete driveway can dramatically boost your curb appeal and it’s a more cost-effective alternative to natural stone or concrete pavers. Sealing your driveway is one of the most important things you can do as a homeowner or business owner to extend the life of your driveway. When left unsealed, water can seep through asphalt or concrete and create pools of water below the surface that lead to cracking. Sealing can also improve the appearance of decorative stamped concrete. A stone driveway is generally the most affordable type of driveway solution and the longest-lasting. 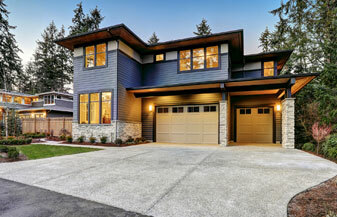 While stone is not as popular as asphalt or concrete, it comes with many advantages, including virtually non-existent maintenance and a lifespan as long as the home. You can also choose the type of stone that best complements your landscaping and home. Sometimes there is a middle ground between constantly patching a damaged driveway and paying for repaving. Driveway resurfacing involves removing the top layer of the driveway and replacing it. This results in a driveway that looks new without the cost of repaving. Resurfacing is a cost-effective solution as long as your driveway is free of foundation issues. Even the best driveway won’t last forever. An asphalt driveway can last for around 20 years while a concrete or paver driveway is expected to last about 25 years. 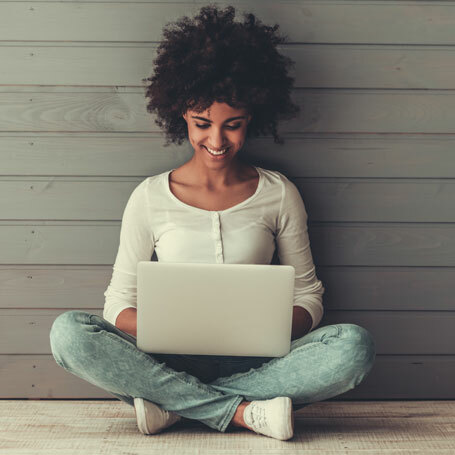 At this point, repairs are unlikely to address any problems you may be experiencing. Not sure if repaving is the right choice? Virtually every driveway eventually shows signs of wear like cracks as the material breaks down. A concrete driveway is less likely to develop serious cracks than asphalt because it is installed in sections with joints, but there are several factors that can contribute to excessive damage to your driveway. Incorrect or excessive sealing can cause cosmetic damage to the surface of your driveway. With asphalt riveways, this may result in alligator cracking of the surface. A poorly constructed sub-base or base is a leading cause of premature driveway failure. Always choose qualified driveway contractors who will not cut corners. A slab of concrete can withstand a great deal of weight, but it’s not indestructible. Damage can occur with repeated parking or driving of oversized loads like an RV. They apply pressure to areas of the driveway and the foundation. This will eventually cause a crack in the concrete or even lifting of a section of your driveway. Avoid planting large trees within 20 feet of a driveway and small trees within 10 feet. The best way to prevent early wear and tear to an asphalt or concrete driveway is having it installed correctly by professionals. From there, you can occasionally have the driveway sealed to prevent excess water and liquids from seeping in. If your not sure about getting your driveway done or you still have some questions, take a look a some of our most frequently asked questions. If you still have any additional questions that are not answered below, please give us a call, we are happy to help. 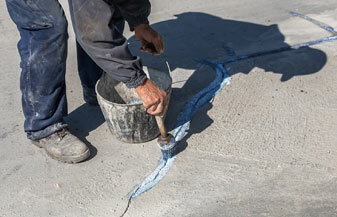 Unlike asphalt, concrete can and should be sealed as soon as possible after installation once the concrete is dry. The sooner your driveway is sealed, the better the protection against the extreme heat and occasional rain in the Las Vegas Valley. How Soon Should A Driveway Be Sealed After Installation? An asphalt driveway should not be sealed for at least six months after installation to allow the oils in the asphalt to evaporate. If sealer is applied before the asphalt cures, the driveway will not achieve the necessary level of hardness. 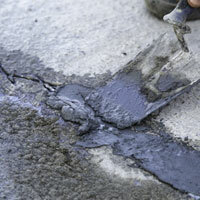 If your driveway has cracks, potholes, or any signs of wear, these problems should be fixed before a sealant is applied. 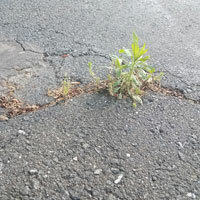 The type of repair will depend on whether you have a concrete or asphalt driveway and the size and number of the cracks. What if I Have Oil Stains? 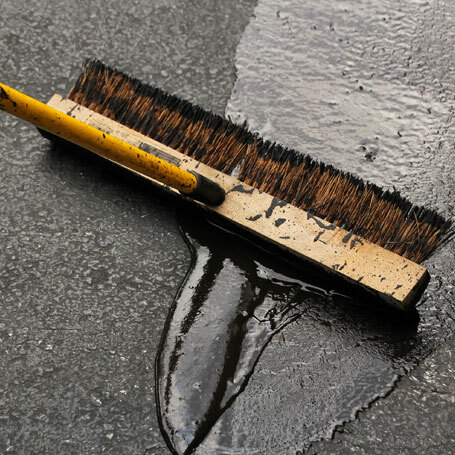 Oil stains aren’t just unsightly; they can also cause damage to an asphalt driveway. Sealing your driveway is the best way to prevent damage from oil, but what if your driveway already has oil spots? Sealer will not stick to oil stains, which means the stain should first be torched and treated with a primer before the sealer is applied. Why Sealcoat An Asphalt Driveway? Sealcoating an asphalt driveway comes with many benefits. This form of preventative maintenance helps seal small cracks in the surface before they develop into larger cracks and it stops water from seeping into the base. A new sealcoat will also restore the shiny black color of the driveway to make it look like new. 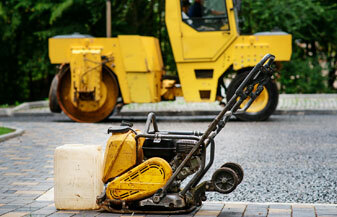 You may also want to have your asphalt sealcoated to hide any rough spots or patches that have been made. A driveway that has been sealcoated also tends to look cleaner and brighter because rain will wash debris away from the now-smooth surface. The cost of a stamped concrete driveway depends on several factors, most importantly the square footage of your driveway and the pattern you choose. Stamped concrete is created by laying wet concrete and using stamping tools to add designs or texture while the concrete is wet. The concrete can also be dyed to achieve the look you want. Stamped concrete can also be installed over an existing concrete driveway in good condition. As a general rule, using multiple accent colors, adding hand-stamped decorative elements, or choosing a complicated pattern will increase the price. Most stamped concrete driveways cost anywhere from $2,500 to $6,000, but your cost may be higher or lower. You can get an accurate estimate for your project by contacting our experienced concrete driveway contractors. 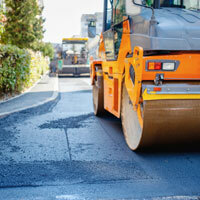 In general, an asphalt driveway should be sealed every 1-3 years. Concrete is more durable and only needs to be sealed every 5 years or so. Can Alligator Cracking Be Fixed? If your driveway has alligator cracking, which makes the surface resemble an alligator’s hide, you likely have failure of the sub-base of the driveway. Patching alligator cracks is rarely a good idea because at best it will only offer a temporary solution. If the cracks are patched with a rubber-based filler, the hot climate of Las Vegas can actually cause the tires of a vehicle to adhere to the filler and pull the pavement out. What is the Cost of a Stamped Concrete Driveway? Should I Consider a Concrete Paver Driveway? If you want a driveway that serves as a focal point and dramatically boosts your curb appeal, concrete pavers are a good choice. Pavers come in a huge variety of styles, shapes, colors, and patterns for a unique driveway that best complements your landscaping and home. Because pavers interlock, installation is usually faster than other driveway materials. This design also improves the surface strength. Concrete paver repair can also be more affordable because individual pavers can be removed and replaced as needed. 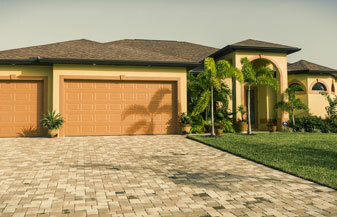 With proper installation, you can expect a concrete paver driveway to last anywhere from 25 to 50 years. If you want a driveway that serves as a focal point and dramatically boosts your curb appeal, concrete pavers are a good choice. We take pride in offering our customers the best possible customer service and reliable, cost-effective driveway solutions. Whether your aging driveway is in need of repairs or you are interested in repaving, a stamped concrete overlay, or a new concrete driveway, contact us today for a free estimate on your project.